Tr is the reduced temperature, Pr is the reduced pressure, and ρr is the reduced density. 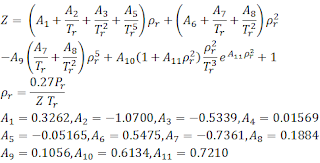 The correlation is only valid for 0.20 ≤ Pr < 30, and 1.0 < Tr ≤ 30. The constants A1 to A11 were found by a best−fit to the Standing and Katz chart with an average absolute error of 0.585%. 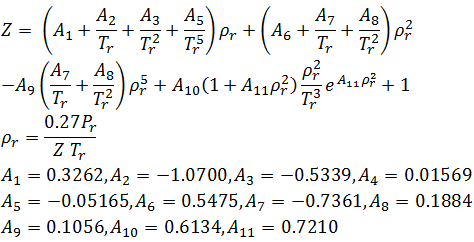 The Dranchuk-Abou-Kassem equation is implicit; solving for Z requires an iterative solution method. Several several methods exist in Excel, and the spreadsheet demonstrates two of these methods. I've found that the result given via Goal Seek is more numerically stable (the circular reference often gives unrealistic results). There's a button in the spreadsheet to initiate Goal Seek. If you want Goal Seek to automatically recalculate the compressibility factor whenever the reduced temperature or pressure are changed, add this VBA to Sheet1 in the spreadsheet. MsgBox "Goal Seek Failed for Compressibility Factor"
You may also want to check out this Excel spreadsheet which uses the Beggs and Brill correlation to calculate the compressibility factor of natural gas.